Every small holiday of the year can be celebrated joyfully with crochet. St. Patrick's Day is a surprisingly fun holiday to craft for. You can avoid getting pinched by adding some green crochet shamrocks to your outfit. You can easily dress up the house for a party. The shamrock is a lucky pattern and although we most often see it in March, it can also be used as a design motif throughout the year. The three-leaf clover in particular works as a leaf element in different designs. You can work it in traditional green yarn or make more unique designs with colorful yarn changes. This crochet applique pattern is a classic three-leaf shamrock. However, it also includes the instructions to make it a lucky four leaf clover if you want to craft that variation. Either way, this is a terrific design that is three-dimensional enough to pop off of any project it is sewn to. Use a pin to add it to a hat, shirt, or tote. You could also string a set of these into bunting for a St. Patrick's party. Take any small motif then add a long chain and you've got a cute bookmark. That's exactly what we see here with the four-leaf clover motif. Make some in several shades of green and smile every time you open a book that you've been reading. This free crochet pattern also includes a video tutorial to help you learn how to crochet a shamrock. Have you ever noticed that the leaves of a shamrock look like hearts? 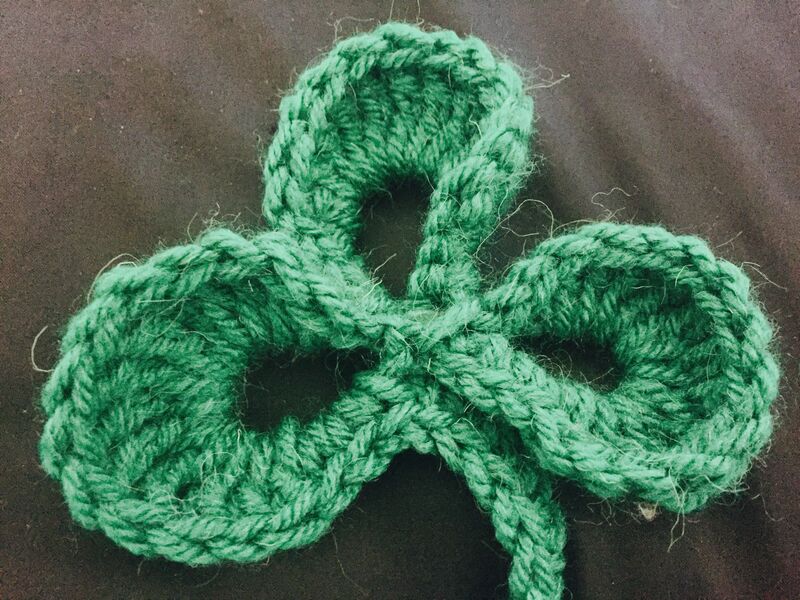 Use that as inspiration when making this crochet shamrock. The wide long stem on this one is unique, and it makes for a fun applique. Sarah Zimmerman of Repeat Crafter Me has terrific free crochet patterns of all kinds. In this example, she has used a basic chart, a simple color change, and some easy rows of single crochet to create a really beautiful shamrock crochet scarf. This is the perfect St. Patrick's Day accessory! And although it is ideal for that holiday, it's something that you could use throughout the year when you want a pop of color for your outfit. 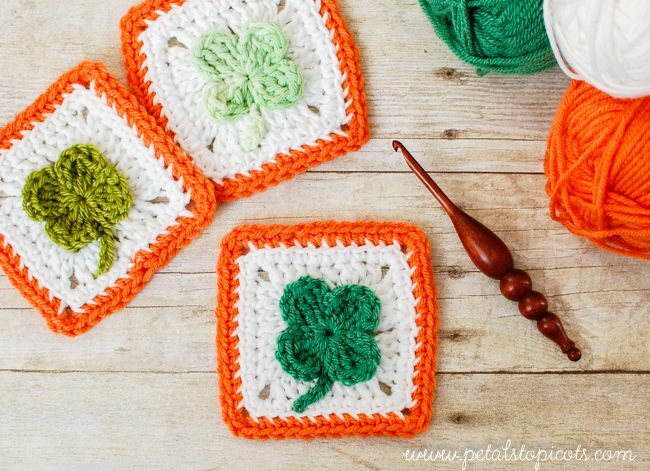 Kara over at Petals to Picots shows us how to crochet a lucky four leaf clover in three different shades of green and attach it to orange and white blanket squares for a fabulous mix-and-match crochet blanket. You could vary the colors to suit your own style, of course, in order to personalize your own crochet shamrock blanket. A single square can also be used as wall art—or worked in a cotton yarn it could be a washcloth. Perhaps the crochet shamrock pattern that you're seeking is one for just the flower-like plant itself. Look no further than this free tutorial for a really great option. This crochet pattern is great for making an appliqué or for crafting shamrock jewelry. If you look closely at this free crochet cowl pattern, you will be able to see the little clovers that are worked into the design. It is subtle but perfect. The designer recommends that you don't skip the blocking step, as it really helps to stretch out the design and show off those shamrocks! This is an accessory that you can wear throughout the spring and into summer. She's Got The Notion created a free three-leaf clover pattern that can be used as an appliqué, for bunting or in other projects. She created another one for the lucky four leaves. She then took it a step further and created a free tutorial for turning it into a pretty potted plant. This would be great decor for your desk during the month of St. Patrick's Day and all year round. It is also a unique gift to give someone at any time of year. Decorate your St. Patrick's Day party (and keep your surfaces clean) with a set of these adorable crochet clover coasters. This crochet pattern is offered as a free download through Ravelry. As with other patterns, it could alternatively be used as an appliqué or for making bunting. Since it is a small project, it works up quickly, which means you can use it as an instant gratification project. This is one of the most unique crochet clover patterns available. It is lacy, open and eye-catching. If you're looking to make something different that is still easily recognizable, this is the pattern you want to bookmark. One terrific way to incorporate designs like a shamrock into your work is through the technique of tapestry crochet. That's how this crochet phone cozy design was made. It's a nice small project for practicing the technique. Plus it gives you a functional item to keep gadgets safe all year long. Who said that shamrocks have to be green? Why not make one in a rainbow color and wear it all year long? This is a free slouchy hat crochet pattern by that uses a tapestry crochet graph to add a colorful shamrock to the design.